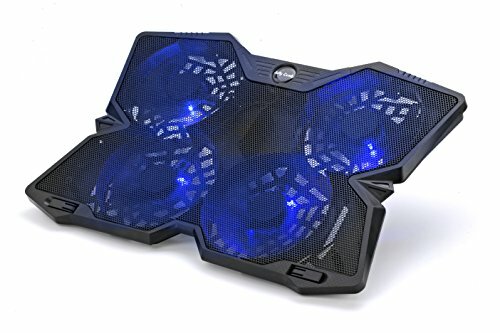 Jelly Comb Laptop Cooling Pad creates a continuous and evenly dispersed air flow beneath your laptop to dissipate the heat generated by the CPU and GPU trapped in the laptop housing. It has great cooling power and all features you need but slim, light weight and quiet. Compatibility: Supports all laptops up to 17"
Slide the switch clockwise to turn on the pad and speed up. For the best cooling effect, you need to turn the rolling switch to the maximum grade. 【Universal Compatible Cooling Pad】-- Designs for laptop / notebook up to 10"- 17". Ideal for gaming, working, school, studying and more! The adjustable fan speed allows you to control and set the airflow to meet your needs. 【Solid, Slim & Portable】-- Excellent metal mesh material and lightweight design offers excellent portability and reduce the likelihood of overheating that can lead to crashing. 【4 Ultra Quiet Fans】-- 4 high performance 130 mm fans can spin at 1200 RPM to dissipate heat from gaming laptops. Less than 28db even at fullest speed. 【Extra USB Port】-- Our laptop cooling pad designs a built-in dual USB hub. You can power the fans as well as plug in an additional USB powered device. Talk about convenient! 【Ergonomic comfort】-- Adjustable height setting, comfortable for natural point of view with 2 viewing angles available for the most comfort in use, 10°/ 30°adjustable. Dial 3078 DuraCool Cooler Pad, 29" x 144"